WHO: American alt.rapper, hippie icon, social activist and renowned all-round nice guy Michael Franti takes a camera and a guitar to Iraq, Israel and what he calls Palestine, and, as well as a documentary movie based on the experience (I Know I’m Not Alone) returned to record Yell Fire!, Spearhead’s finest hour. 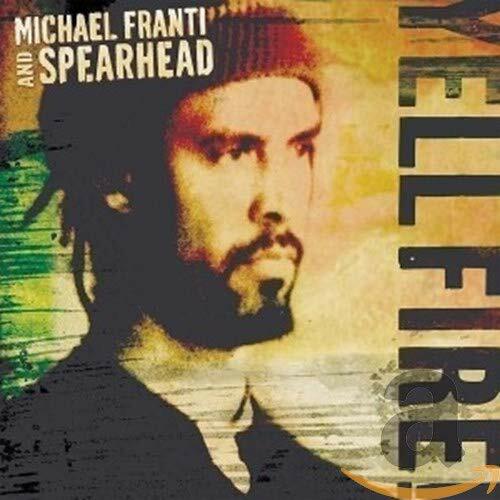 WHAT: On Spearhead’s last album, Stay Human, Franti – whose politics extend back to previous bands The Beatnigs and Disposable Heroes of Hiphoprisy – crushed his music with the weight of its message. On Yell Fire!, he has finally achieved the ideal balance. Musically, the album divides between ragga-reggae recorded in Kingston, JA with Sly Dunbar and Robbie Shakespeare as rhythm section, and more soulful rock ballads recorded in Spearhead’s San Francisco hometown. The result is a Carribean-flavored album that makes you move as much as it makes you think. And while sometimes it makes you want to shout and occasionally makes you think of despair, it’s still the most upbeat hour of anger I’ve heard in a long time. WINNERS: Indeed, Yell Fire! works best when it’s musically positive, a rhythmic framework that still enables Franti to get lyrically righteous. ‘East To The West,’ ‘Hello Bonjour,’ ‘Everybody Ona Move,’ ‘Light Up Ya Lighter’ and the title track ‘Yell Fire’ are all (occasionally too) simple, tropically flavored dance(hall) tracks, any of which could ignite a (political?) party. WHINE: Spearhead’s attempts at soulful rock descend into U2 lite: the first single ‘I Know I’m Not Alone’ and ‘See You In The Light’ both sound like poor imitations of Bono’s ‘One.’ With 14 songs, Yell Fire is at least two tracks too long. And if you get too close, Franti’s artistic limitations become apparent. Better to view Yell Fire as a package. WEB: I expected more from Spearhead Vibrations than the opportunity to vote on the upcoming tour poster, download four old songs via MP3s, and read just the odd news story and review of the new album. Franti, of all people, seems like a man who should be blogging. WINE: Franti is a vegan yoga master who eschews shoes. In which case, even if he’s teetotal, he surely won’t mind me recommending the Barefoot line of wines from his native California’s Sonoma County: easy wines at comfortable prices, they won’t stand up to the competition of the grand masters, but they evoke the hippy lifestyle, and are guaranteed to get a party started.